Sonoma Valley is a beautiful, biologically rich watershed with an abundant quality of life enjoyed by residents and visitors alike. Whether expressed in breathtaking scenic vistas, exceptional trails, or a world-class agricultural heritage, our bountiful ecological resources comprise a spectacular natural legacy. The Sonoma Ecology Center works to retain this remarkable legacy for the future. Our mission is to work with our community to enhance and sustain ecological health in Sonoma Valley. Sonoma Ecology Center’s Research and Information Services Program is a team of scientists and computer technology specialists who work together to increase our understanding of our watershed, its natural resources, and the processes that keep it healthy. The Program also houses our Geographic Information Systems and Historical Ecology groups, and we are the stewards of the most comprehensive collection of environmental data and information about Sonoma Valley Watershed – the Sonoma Valley Knowledge Base. We continue to build upon this knowledge through research projects in collaboration with other organizations working in the watershed and North Bay region. Restoring damaged parts of our natural heritage is a vital part of our work. We apply the best available science and techniques to repair habitats in streams and on the land—planting trees, building stream pools, removing invasive weeds—recreating the niches that Sonoma Valley’s native plant communities and animals need. With the help of willing landowners and dedicated volunteers, the bounty and beauty of Sonoma Valley spring back to life. Our education programs are grounded in two principles: empowerment and action. From science education in elementary schools to lectures and outings for adults, we strive to not only increase the environmental literacy of our diverse community members but inspire them to act. The Sonoma Garden Park is a 6.1-acre working farm, located on 7th Street East in Sonoma. Donated to the City of Sonoma by Pauline Bond, the property is an ideal showcase for sustainable gardening education. The Park features demonstration gardens, strawbale barn, fig forest, pumpkin patch, over 150 fruit trees, bee hives, interpretive displays, solar well, crop circle, as well as scenic walking trails. Visitors can rent community garden plots, shop at the harvest market, observe wildlife, and picnic, all while gaining a greater awareness about sustainable gardening. To learn more, visit Sonoma Ecology Center. 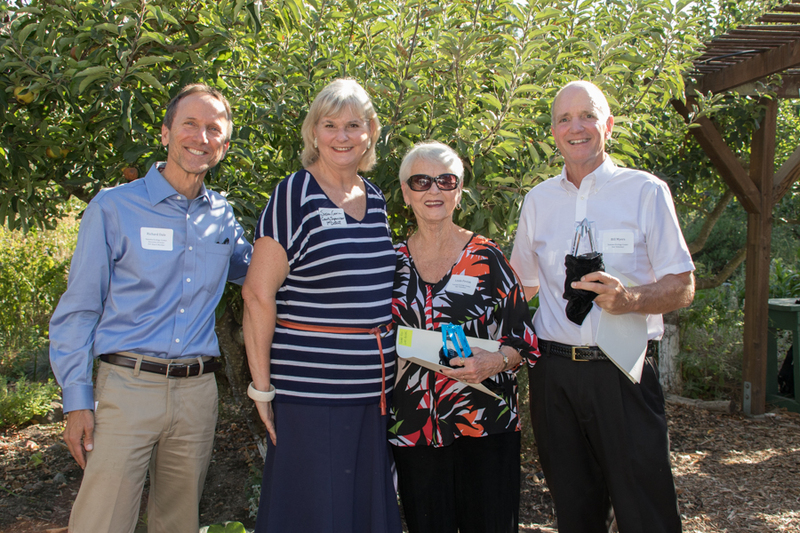 Sonoma Ecology Center's Executive Director Richard Dale (left) and Supervisor Susan Gorin (2nd from the left) present Bill Myers and Linda Pavlak with this year's Star Award. When the state announced it was closing 3 parks in Sonoma Valley, and SEC stepped in to lead the effort to keep Sugarloaf open, there was only a vague idea of what to expect. From the start, Bill Myers stepped up to help. Bill imagined and then hosted several, now annual fundraisers, including a 4th of July fireworks viewing party on top of Bald Mountain, and more recently, with his delightful partner Linda Pavlak, Funky Fridays. Linda and Bill reached deep into their professional network to bring great music from around the Bay to the park every Friday summer evening, for a fun danceable experience in one of the most scenic venues imaginable. Bill and Linda created an amazing experience, requiring hundreds of hours of their time as volunteers. They've helped lead a movement to rebuild community support for a jewel of a park, raised over $100,000, and even made the whole process a lot of fun. From all at Sonoma Ecology Center and Team Sugarloaf are delighted to recognize Bill and Linda as stars!